Filling in as Speaker of the House, Rep. Dan Moul positions his bill for consideration in the House next week. House Bill 544 would guard landowners from liability when they allow the public free use of their land for recreational purposes. 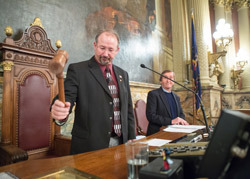 HARRISBURG – Rep. Dan Moul (R-Adams/Franklin) served as speaker pro tempore during today’s non-voting session at the state Capitol. In his temporary role as House speaker, Moul signed three bills that will now go to the governor to be signed into law. He also read several bills into the record, including one of his own, which positions the legislation to be considered when lawmakers return to the Capitol on Monday, Dec. 16. Moul’s legislation, House Bill 544, would protect property owners from liability when they permit the public to use their land – free of charge - for recreational purposes. The bill would benefit outdoor enthusiasts and landowners in Adams and Franklin counties and in other rural areas and open spaces across the Commonwealth. Elected to the House in 2006, Moul said acting as speaker pro tempore is a privilege generally reserved for more senior members of the House who are asked to fill in in the absence of the Speaker.